Dubai, UAE: November 15, 2015: Today, Pringles achieved a groundbreaking milestone that will go down in history: the leading snack brand became the official holder of the Guinness World Record for the ‘World’s Largest Can Pyramid’. The massive pyramid was revealed at an exclusive event hosted by renowned radio DJ Kris Fade and held at the GÉANT Hypermarket located in Dubai’s Ibn Battuta Mall. During the unveiling ceremony, the Pringles team was also granted an official Guinness World Record Certificate. This incredible stunt was orchestrated by amassing a staggering 31,000 cans of Pringles – flavors include Original, Hot & Spicy and Sour Cream & Onion – and stacking them up to form a colossal pyramid that measures three meters in height and 21 meters in width. 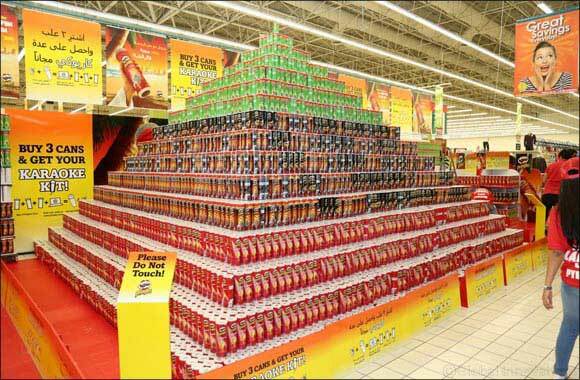 Previous holders of this record had constructed a pyramid consisting of 30,852 cans. Pringles’ record-breaking can pyramid will be on display at the GÉANT Hypermarket – located in Dubai’s Ibn Battuta Mall – until 17 November.